Alright, as many of you know we gained a new member to our little family in April! Farrah is now 4 months old & all smiles! 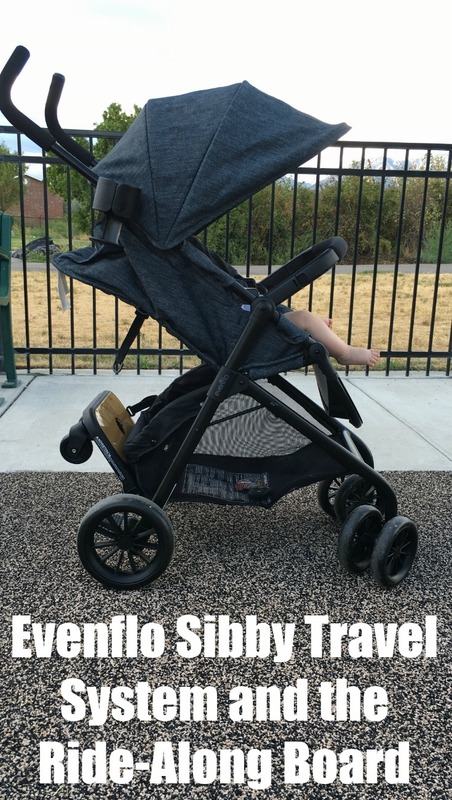 I love my little Farrah, but I do miss the convenience of traveling with just one child! I can't tell you how many times people catch me walking with Farrah in her car seat in one arm and my 2 year old in the other! And on top of it all, I may be the only mother who HATES baby wearing! I get all sorts of sweaty from it, especially now that it's summer time. I recently had the opportunity to try out the Evenflo Sibby Travel System and the Ride-Along Board (now available at Target) and you have no idea how much easier it makes my daily activities! I can avoid the bulkiness of the double stroller that my 2 year old won't sit in anyway, and I still have the option of toting both children with the Ride-Along Board attachment for David while baby Farrah sits in the main seat. When David is not using the attachment, I can just fold it up very quickly & continue on our walk. The Travel system also comes with a super light weight car seat that can actually sit in the stroller as well (I love this for if Farrah falls asleep on the drive and I don't want to wake her). Honestly, this travel system is pretty straight forward & super easy to assemble I personally didn't even need the instruction manual. My 2 year old was even able to figure it out on his own! All-in-all super easy to use, glides smoothly, has a large storage basket in the bottom (with front & back access), & it's pretty versatile, plus my baby girl thinks it's pretty comfy! And it comes with a car seat! I'm all for deals like this! Don't forget, this deal is available at Target, so be sure add it to your registry! Congratulation! Raising 2 children is a struggle but love it at the same time. It is a cute stroller. Thank you for sharing. Keep posting.